Anyone who has enjoyed a massage knows that the health benefits of touch extend beyond merely soothing aches and pains. Massage can help treat symptoms of anxiety and depression by reducing levels of the stress hormone cortisol, creating a boost in spirits and often lower blood pressure. Massage can also trigger the neurotransmitters serotonin and dopamine, which are powerful depression-fighters. The stress-reducing powers of massage can also help boost your immunity and keep you healthy. Along with everyday aches and pains, exercise can take an extra toll on your body. It should come as no surprise that a 2012 study found massage really does work to ease sore muscles after a tough workout. Even a short 10 minute massage can reduce inflammation, which can help your body recover more quickly. A number of studies have examined the link between regular massage and a good night’s sleep. A positive connection has been found due to the effect massage has on delta waves, the type of brain waves connected to deep sleep, according to Health magazine. Did you know that massage can even help your complexion? “Massage increases blood flow, which plumps up slack skin, encourages lymphatic drainage (the shuttling of toxins out and away from cells so that more nutrients can travel in) and adds vitality to a dull complexion and lackluster hair,” according to Kimara Ahnert, a New York City skin care studio owner. The best part is that you can treat yourself without taking the time for an expensive facial- simply rubbing your face and scalp for a few minutes can make a big difference. A 2009 study found that a 30-minute massage decreased pain for people with tension headaches, and even curbed some of the stress and anger associated with that pounding head. Regular massage can reduce a person’s number of migraines, according to WebMD, as well as limit how painful each migraine feels. In order to give a proper massage (one that feels good), a lubricating agent is necessary to reduce friction. Our massage oils and lotion are rich in vitamins, absorb into the skin without leaving an oily residue, do not have a drying effect on the skin and are the right weight for massage. 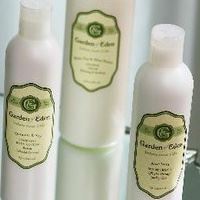 At the Garden of Eden we carry a variety of our own unscented oils and lotion that are ideal for massage. The products come in three sizes (4, 8, and 16 ounces), are refillable and can be custom-scented with over 100 perfume and essential oils. Our Massage and Bath Oil is a water-soluble blend that is a combination of vitamin E, sweet almond, avocado, grapeseed, safflower, and sesame oils, making it the ideal weight for the benefits of massage. Another effective massage oil is our unscented Sweet Almond Oil. Pure and simple, it provides a gentle glide for a relaxing massage and is easily absorbed by the skin. It’s often called “the perfect massage oil” due to its light weight. Our popular Massage and Body Lotion contains the same natural oils as the Massage and Bath Oil, including therapeutic levels of vitamin E to soothe, soften and hydrate the skin. Best of all, it is non-greasy and specifically created for massage. The secret is that because our oils come unscented, you can choose the scent that will help you relax, uplift your spirits, or soothe your aches and pains. Favorite essential oils used for scenting include calming Lavender, invigorating Peppermint, and warming Juniper Berry. Along with a large selection of aromatherapy oils, we also carry a variety of safflower-based perfume oils with scents ranging from soft and floral Jasmine to warm and comforting Vanilla. 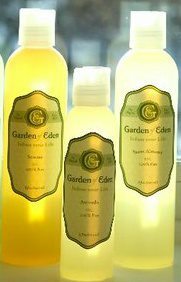 Scent is very personal, so at the Garden of Eden, we encourage you to take your time and discover the scent that works best for you! Visit us online or our one-and-only St. Paul store at 867 Grand Ave to create your own unique massage oil or lotion.